Security researchers at Trend Micro announced on January 8 they had identified 85 Google Play Store apps that repeatedly displayed ads and maliciously hid while running in the background. Google Play Store removed these 85 apps after verifying Trend Micro’s report. The adware concealed itself as games, streaming TV and remote control stimulator applications. Around 9 million Android users downloaded these bogus apps worldwide. Frustrated users experienced full-screen pop-up ads that were configured to appear at 15-30 minute intervals or whenever the device was unlocked. One of the apps - “Easy Universal TV Remote” - had over 5 million downloads. It accumulated tons of unfavorable reviews, many of which were mobile crash issues and annoying advertisement pop-ups. Harmful apps like those recently removed have been closely monitored. Although new apps are passed through stringent malware checks, adware keeps finding a way to the marketplace. Testing researchers discovered that the apps came from different authors and APK cert public keys, but all belonged to the same active adware family (detected by Trend Micro as AndroidOS_HidenAd). Download only from the official Google Play Store (Android users) and iTunes or App Store (iPhone users). Choose trusted brands and read reviews. 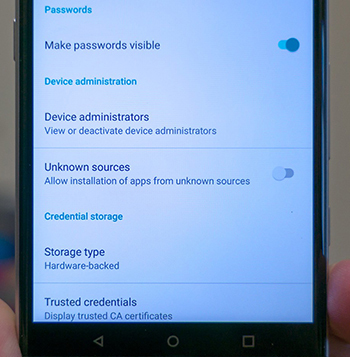 Disable third-party apps by unchecking “unknown sources” on your Android’s security settings. This will keep dangerous apps from being installed outside of the app store. If you are experiencing similar problems, take a quick look at recently added apps and uninstall any that aren’t behaving as intended. Analecta brings decades of expertise implementing secure information systems based on national guidelines. If you are looking for expert advice on implementing a cybersecurity program for your company, or need advice on where to begin, email us at at info@analecta-llc.com or visit our Cybersecurity website. We are here to help! Analecta Cyber is a Maryland-based cybersecurity firm providing cyber risk assessments for small and medium sized businesses. Analecta is a trusted partner to help companies achieve their cybersecurity objectives.